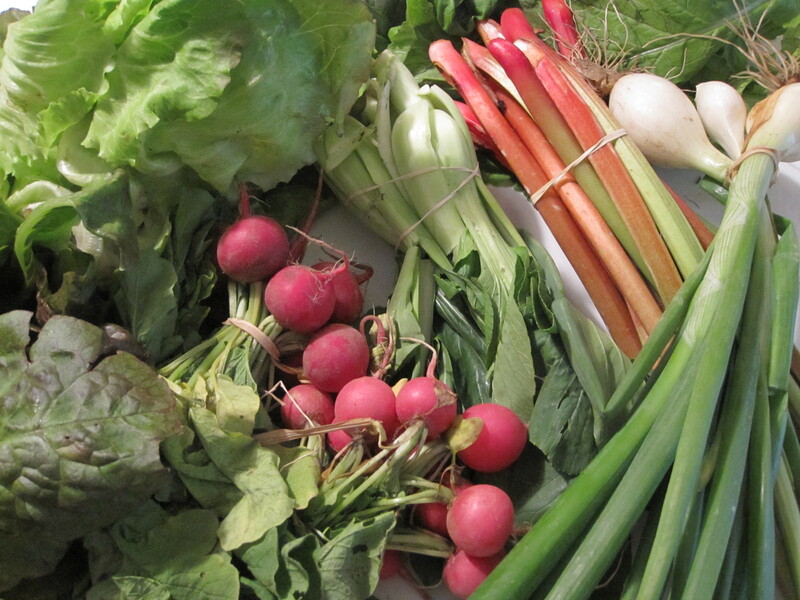 I have to admit that last week’s turnips are still in the refrigerator, along with the kohlrabi I bought last Saturday at the farmer’s market. A bastardized coleslaw is surely in our future. The only disappointment: No garlic scapes! I may hunt some down tomorrow so I can make a bean dip recipe I came across. Stay tuned. 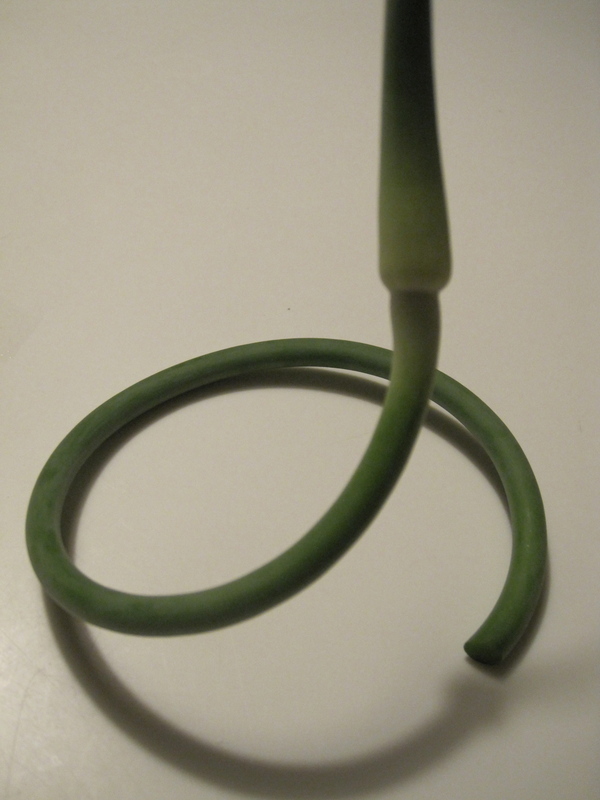 I first noticed garlic scapes at the farmer’s market last summer. They’re hard to miss — bright green and curly and, well, seriously odd looking. 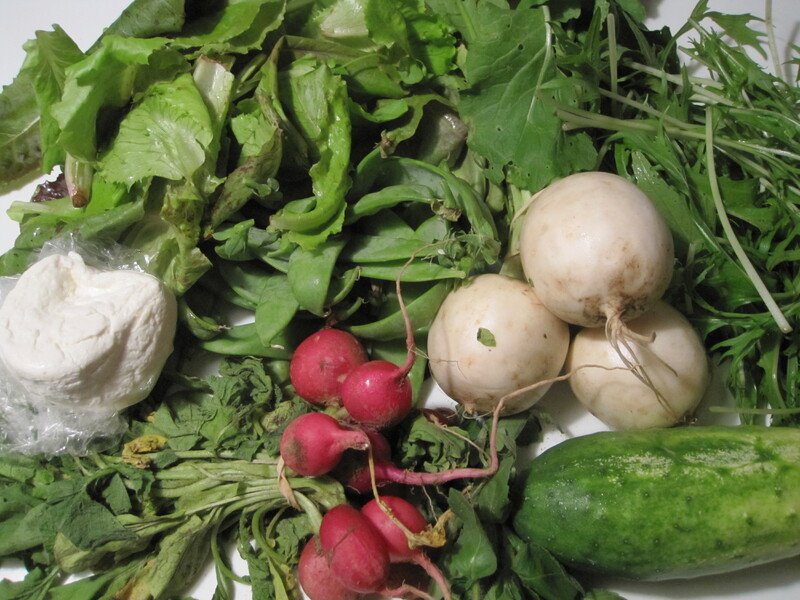 But none showed up in our CSA box, and my plate was full (literally) dealing with all of the new vegetables that did. But when I opened last week’s share, there they were. And I had to figure out what to do with them. 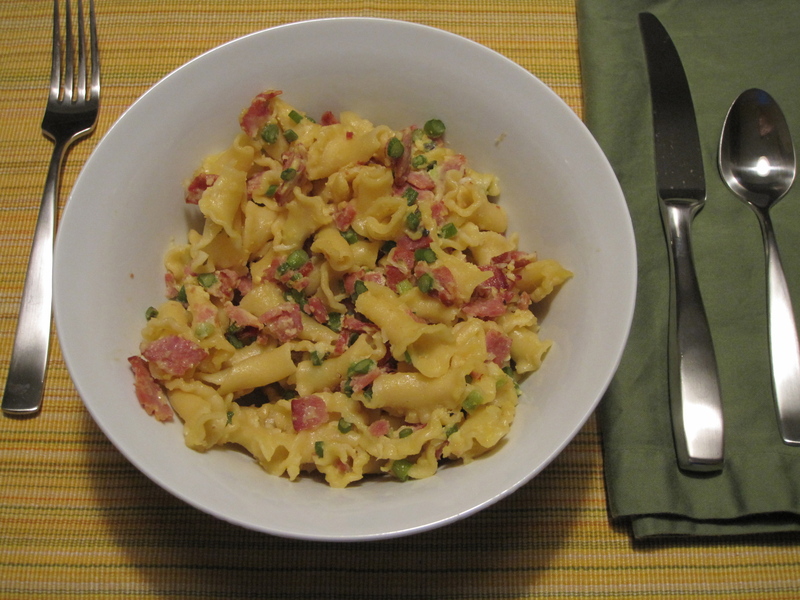 Googling yielded this recipe for Garlic Scapes Carbonara, on the Sarah’s Cucina Bella blog. Although I was nervous that using raw eggs to make the sauce would result in pasta with scrambled eggs instead of creamy carbonara, I decided to give it a go. Wow, am I glad I did. It’s a quick dish. Chopping the garlic scapes took the most time, because they’re so curly. I should’ve tackled them first, before I started the bacon instead of while it was frying. Add fresh peas, as Sarah suggests. I planned to buy some at the midweek farmer’s market, but didn’t make it. Use pancetta or real bacon instead of turkey bacon. I only had turkey bacon on hand and, while the end result was fine, I know real bacon would’ve added more flavor. Plus, the turkey bacon left the pan dry, so I had to sauté the garlic scapes in olive oil instead of bacon grease. Use a bigger pot. The pot I typically boil pasta in was a little cramped when stirring in the egg. Four summers ago, I spent a warm and sunny afternoon on the south bank of the River Thames, at London’s famous Anchor pub, enjoying a Pimm’s cup — the quintessential English summer drink. I’m not sure if it was the mysterious gin-based liqueur mixed with lemonade, strawberries, cucumbers and mint, the breezy Katie Fforde novel I couldn’t put down, or just being on a solo adventure in such an amazing city, but that afternoon is one I look back on often and smile. Unfortunately, Mike doesn’t partake in Pimm’s. He claims the concoction, which ends up being brown with stuff floating in it, looks like “a garbage disposal backed up.” When we first started dating, he refilled my glass and tossed in his beer cap to further demonstrate his point. Yum. So, I made a pitcher (a “jug of Pimm’s” in London-speak) the other night for my friend Kim and me. While the view from our back porch doesn’t exactly compare with the one from the patio of The Anchor, it was still a lovely night. And a lovely drink. 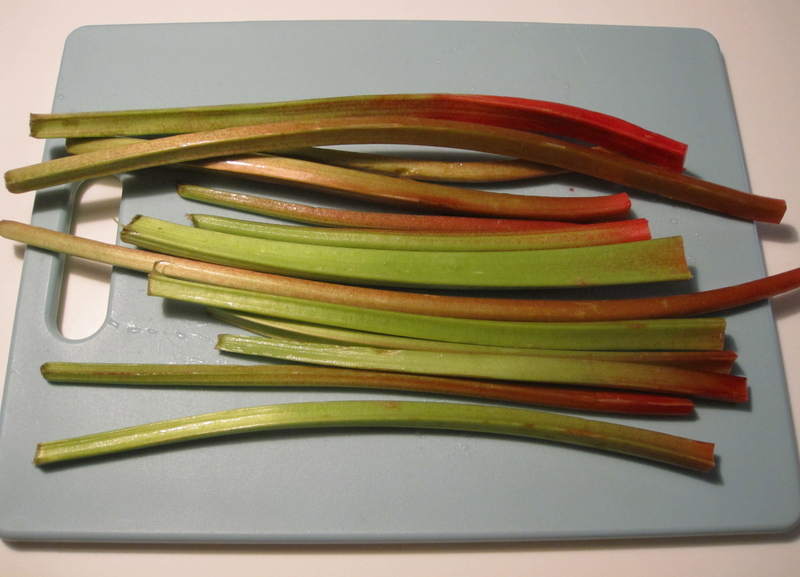 But until last summer, my rhubarb experience was limited to only store-bought jam. I’d never cooked with it. 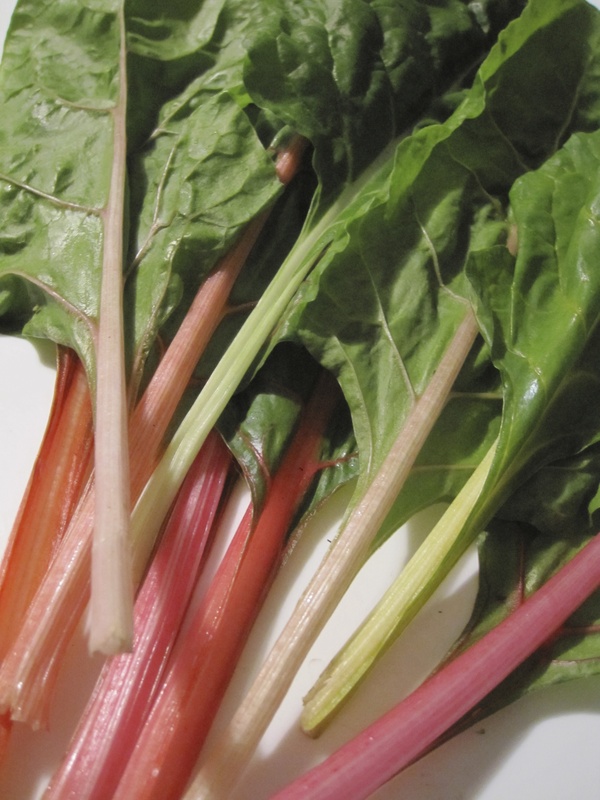 So when our farm promised rhubarb in a weekly CSA box, I was excited. The finished product, with its oatmeal, cinnamon and brown sugar topping, was so pretty that I took it to my newish in-laws’ house. I’ll admit it, I was damn proud. 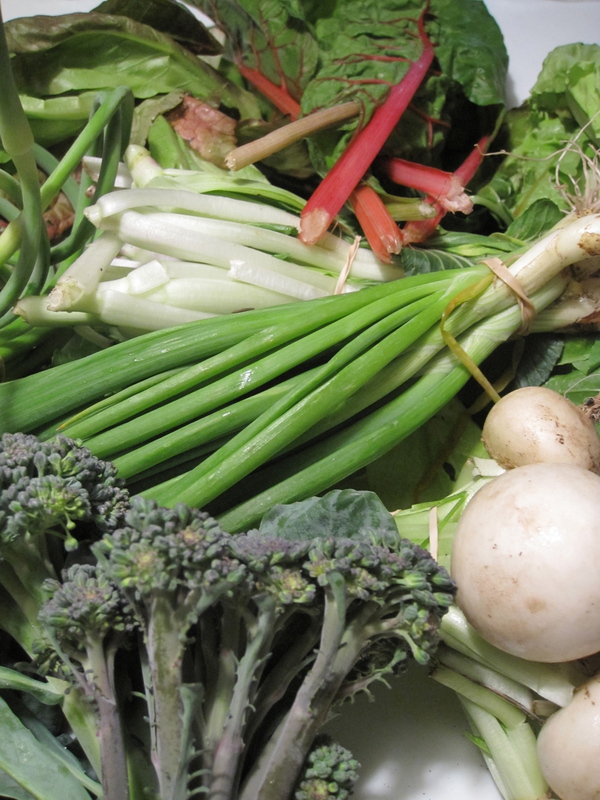 It’s the third week of our CSA share, and we’re still in the green. I’m most excited about the garlic scapes, which I’ve never had and have no idea what they even taste like — although I assume they’re garlicky. I plan to search some recipes tonight. Mike wasn’t so excited to see another bunch of bok choy. I’m not sure why, as I ate last week’s bunch all by myself. I love the crunchiness and how easy it is sauté them in a little garlic and olive oil. The only conundrum is the turnips. Really, turnips? I thought they were extinct. 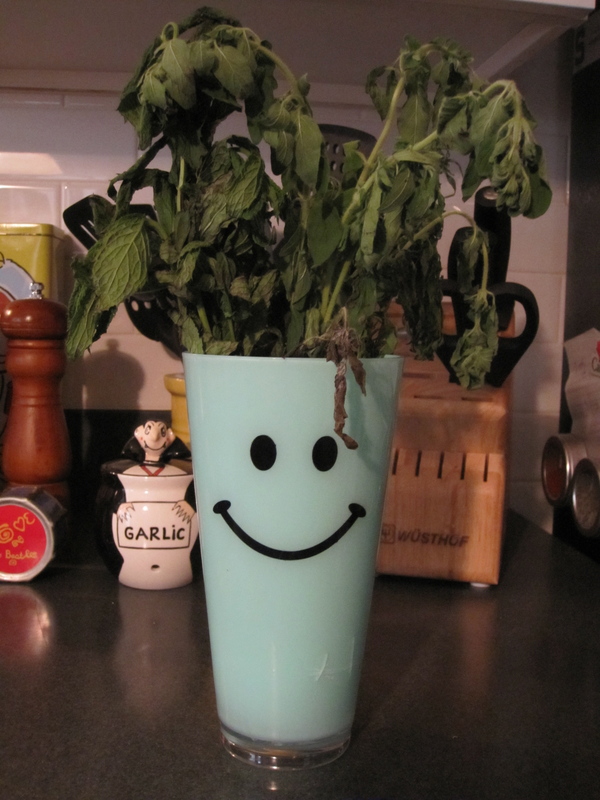 … these herbs aren’t happy. This is the oregano and tarragon that arrived last Friday. I placed the bundle in the refrigerator in the smiley cup, with a little bit of water, but then didn’t get around to using either of the herbs over the weekend. As you can see, the bunch looks wilted and sad today. Very sad. Any tips for keeping herbs fresh? Or should I just hang and dry them next time and call it good? I’ve never cooked mustard greens, and the farmer says they’re “spicy hot.” I’m not into hot. At all. My husband, who’s the opposite, jokes that ketchup is too spicy for me. Needless to say, these mustard greens have his name written all over them. We also received our first bouquet of flowers this week. 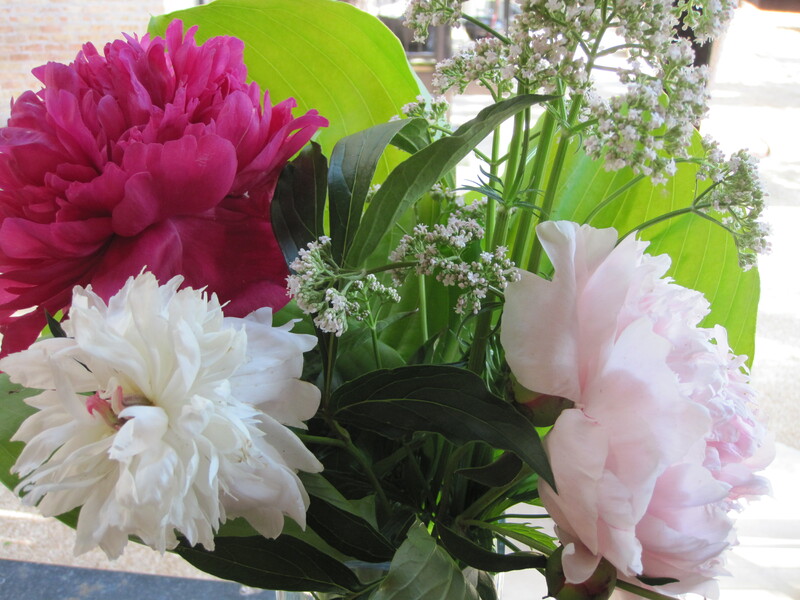 A share add-on, we’re scheduled for 10 bouquets throughout the summer. I must confess that I have no idea what kind of flower these are, but I love the bright and pale pinks. Maybe peonies?